On Sunday, September 21, 2014, GKH attorney Ann Martin spoke at Speedwell Heights Brethren in Christ Church on financial and health care power of attorney issues as part of the congregation’s series on end-of-life issues. Pennsylvania recently enacted broad changes to its financial Power of Attorney law. 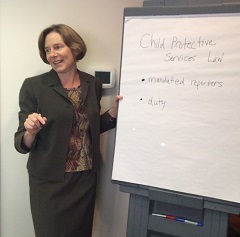 On Monday, October 20, 7 p.m. at the Parish Resource Center, Ann will speak to church representatives about changes to Pennsylvania’s Child Protective Services Law.